Music has played a big part in my child’s bilingual language learning. I used music to make his language learning exciting, and ¡divertido! When we started our bilingual journey, his exposure to the target language was minimal. Besides reading to him in the minority language, and perusing YouTube for cartoons in Spanish, music was and continues to be the best resource to continue to teach my child Spanish. Music has been key element in his language learning because it was fun! Seriously! My child would sing-along out loud to words that he didn’t even understand. Singing along he was acquiring new vocabulary, and at the same time it was facilitating his acquisition of a second language. Music was boosting my child’s memory, too! It was so easy it was for him to remember rhyming words with music, and a predictive pattern. With that being said, I was thrilled when I was given the opportunity to review Mister G’s Los Animales new CD! Mister G is a 2014 Latin GRAMMY nominated artist with six albums of original, award-winning music for kids and families. No wonder! He’s a musical language ambassador for children! Los Animales CD has been a big hit in our home, and car! My child’s and his friends’ reaction when they first heard the CD was priceless! My son, and two of his friends were in the backseat of my car talking non-stop! (Imagine 5-7 yrs. old rambling) The minute the first song “Los Animales” started playing on my CD player in the car I had their undivided attention! With the intro, “¡Hola chicos! They started bopping their heads, laughing, and moving to the music. 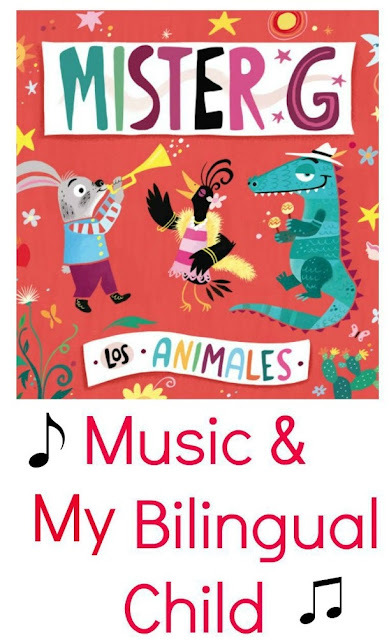 Mister G’s songs are catchy, fun, and bilingual! Besides the songs, there are also three short conversations between Mister G and his friends. These conversations sparked the children to answer, and to speak in both English and Spanish. What I love about this CD is that any child learning either language can benefit from it! Whether the child is leaning English or learning Spanish they can still understand, sing, rock, and dance to the music. Disclosure: I was provided with a copy of the CD of Mister G’s Los Animales so that I could provide a review. However all opinions are my own.